August 28, 2014 – Hi everyone! It’s Ali from Gimme Some Oven. And I’m stoked to be back with you today, sharing a recipe with my all-time favorite thing to buy at ALDI — pineapple!! Oh my goodness, I hope you all have discovered the fabulousness that is fresh and super-reasonably-priced pineapple. It was one of the very first things that sold me on shopping at ALDI way back in the day. They are always in stock, usually at least half the price (or less) of fresh pineapple at other grocery stores, and they are so sweet and satisfying! I actually decided to make it a tradition to pick up a fresh pineapple as a treat every time I shopped at ALDI years ago. And now, years later, I think it’s safe to say I have literally purchased hundreds of fresh pineapples from the store. My friends even joke that an ALDI pineapple is part of the permanent decor in my kitchen. 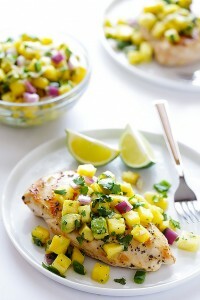 Basically, you just grill up some chicken breasts and then top them with a fresh, flavorful and easy pineapple salsa. (I highly recommend making a double-batch of the salsa for leftovers!) It’s a perfect dish for a summer weeknight, or even a simple crowd-pleaser if you’re entertaining. And of course, it’s a great excuse to pick up some of that famous pineapple. Ali always creates delish twists on dinner favorites. Pineapple and avocado with a little heat of jalapeño? Lovely and on this week’s menu. Aldi my only stop for shopping! but I will try this recipe. I have loved Aldi’s for years!! Thank you for providing good choices at wonderful prices for our meals! love all the healthy receips I can find ,specaly vegetables ! Sounds good. Trying it this w/e!!! I love Aldis ‘Recipe sounds good. I tried it fill out the sweep steaks form but was taken immediately to the recipes! Haven’t tried this, but it sounds yummy.!! Have not tried this, but it sounds Yummy..!! The produce at Aldi always looks so fresh and you can’t beat the prices. Love Aldi’s, always fresh, always good and the prices are wonderful. Thanks Aldi! I love the prices at Aldis. The food is great and the fresh fruits and vegetables are a hit in my house! I Always shop at Aldis food is cheaper and fruit is fresher. the workers are sweeter and helpful. I Love there pineapple. recipe sounds good. Love your food and prices! Aldi avocados are very reasonably priced and so are the rest of the fruits and vegetables. Makes it affordable to cook and eat. Aldi’s is the grocery store I shop on a weekly basis. Love the variety of foods offered. Always having a huge variety of fresh produce!! Sounds easy enough to make it is a must try recipe. We love Aldi’s and shop there. I wish the spaetzle noodles would come back again. The best soup I ever made was with those noodles. Hi Carole, the inventory in our stores can vary by location and our Special Buy items are only available for a limited time. For help locating a product in your area, please contact Customer Service at http://bit.ly/aldicustserv. Love, Love Love Aldi. This is where we get most of our veggies. Make special trip (25 miles away) to go here. Every store we have been in is VERY clean. The meats are beautiful and fresh looking too. Did I tell you I LOVE ALDI ??? Going to AlDI for 12 years now and this store has more choices of product every year! I love aldi’s especially the prices!!! Love Aldi’s….good overall quality for a lot less money!! Hi Karmen, the inventory in our stores can vary by location and our Special Buy items are only available for a limited time. For help locating a product in your area, please contact Customer Service at http://bit.ly/aldicustserv. I shop Aldis all the time. None of my family is terribly keen on avocados–not sure if we’d try this one. i love Aldis i don’t shop anywhere else and neither do any of my children!! It saves me a tremendous amount of money on a tight budget!! With six children every penny counts! Always shopped Aldis in Ky, Now shopping at Aldi’s in …. loving my Aldi’s!!!! Always looking for healthy choice recipes. Going to try this one tonight! love Aldi’s and their prices – this recipe looks delicious! Shop at Aldi’s all the time. Enjoy their produce most. do most of our shopping there. nice friendly employees. I shop there all the time,love everything they have got and the savings in my pocket. We shop at Aldis for most of our food. So thankful for all the good produce ! Aldi saves me hundreds of $ every month, while still eating healthy. I lost 45 lbs by increasing produce in my diet, and Aldi has made it much easier and affordable to maintain my new healthy diet and weight. This looks like a recipe the whe family will enjoy! (And now I can afford organic and gluten free!) Thank you, Aldi! I love using pineapple to sweeten up healthy meals, making them more palatable for our kids. It’s a win/win for everyone! Aldi is part of my Happiness in the USA because I am german and have lived in the US for 20 years! We will have the first store in the Shenandoah Valley shortly!! My friends and I are so excited!! Aldi is part of mt happiness here in the US. I am german, and have lived here for 20 years. We soon will get our first store in the Shenandoah Valley. My friends and I are excited!!!! basic. the savings helps so many families that strive on a low income. thank you for considering our small town to establish another of your stores.. Always Aldi. When I lived in England too. Just fab!!!! I try everything! Love shopping at Aldi’s. Great produce! Loving all of the gluten free options. No longer do I have to make multiple stops when grocery shopping. I especially love the bread and baking mix. Looks and sounds good. Also sounds healthy. I will make this. I always shop Aldi’s. Only go to other stores if Aldi’s don’t have what I need. Once you shop at Aldi’s it hurts me to pay more elsewhere. I always tell my friends. thank you for making fresh fruits and vegetables affordable to my family. I shop at here every week. I love using Pineapple in cooking! The natural enzymes in Pineapple help with digestion and it adds a natural sweetness to all food! I can’t wait to try this! I love Aldi’s fresh produce! Hmm, I think this will go on the menu next week. Just bought chicken and pineapple at Aldis, sounds like a good reciepe to try this week. Sounds very yummy. I’ll try it. I love anything with chicken in it, but this really looks amazing! Can’t wait to try it! Any ideas on calorie/protein/carbs and fat counts? Sure wish Aldi would come to South Texas. Thanks for the recipe! Will try it tonight. You need a print button on your recipe page. I just made this recipe this evening for dinner and it was really good. My family and I loved the pineapple salsa. It was a fun blend of flavors that I will make again! Very good! Hi Jessica! We’re glad you liked it!